Ysgol Y Dderi is an integral part of the local community, and consider that our links with the world around us are very important - we work hard to remain a central focus for both the children of the 6 villages and their families and friends. 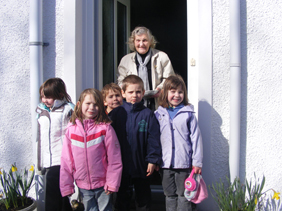 The children visit the elderly at Christmas and other special occaisions. The school is also open to the community as a facility and resource, and some ongoing adult courses are held here. Please click here for further information. The community garden is in the Forest Field at school, and is a project managed by Helen Duffee the Community Co-ordinator and her team. The school take a very active role in the garden and the children have taken on many of the challenges and joys of growing vegetables - some of what is grown is available to buy directly from the school, and the children have made chutneys from some of the harvest. We also use some of what is grown in the school kitchen in preparing our school meals, and the compost produced in the kitchen goes back on the garden. Click here for more information. Bro'r Dderi is the community links organisation that brings the 6 villages of Llangybi, Betws Bledrws, Ll together - visit their website to discover their latest news and projects - why not get involved! A community led initiative that is working to create and facilitate an "Energy Descent" action plan for the town of Lampeter and the surrounding area. In the face of peak oil and climate change, there is a drive towards a more locally based way of life, less reliance on fossil fuels and a greater local network for sustainable transport, food and resources. There are several Transition Towns across the UK and Ireland. Click here to visit the website for TTL.